A Dental cavity is a hole that develops in your tooth after damaging the enamel. This occurs when plaque in the mouth produce acids from food particles that stick on or between the teeth. Proper oral hygiene removes these harmful acids from mouth before any damage to the teeth can occur. While having small amounts of plaque on the teeth is normal, it should not remain on the teeth for more than two days. After two days, it eventually turns into tartar, which turns sugar into acid. These bacteria thrive when you consume sugary products. When left unchecked, cavities can lead to more serious issues like tooth root infections. The earlier you detect a cavity, the better. That gives you a chance to fill it up with a filling and prevent it from damaging the tooth any further. If you are having a hard time getting any sleep or completing any other tasks for that matter due to a persistent toothache, chances are you have a cavity. The pain is often increased when the damaged tooth comes in contact with anything from hot or cold beverages to food. Food particles will often become stuck inside your tooth when you're dealing with cavities, increasing the pain. Bad breath sometimes indicates the presence of cavities. In fact, many people find that bad breath also includes a sour taste in the mouth. Cavities are excellent breeding grounds for bacteria since food particles easily stick to them. The acids that the bacteria produce in cavities can also affect your gums and lead to gingivitis if your oral hygiene habits do not improve. If you notice your breath persistently smells bad, you are due for a visit to the dentist. There are a few other oral health issues that can cause bad breath. Your dentist knows what the solution is for whatever you are dealing with. It is not uncommon for people with cavities to bleed while brushing their teeth. Cavities can grow deep enough to reach the nerves in your teeth, and these often bleed when aggravated. Bleeding gums can also be a sign of gum disease. Either way, you need to schedule an appointment with your dentist immediately. Depending on the location of the cavity, you might be able to see it when you stand in front of a mirror. You can also use a finger to feel your teeth if you think you have cavities. If you are exhibiting other symptoms of cavities like bad breath and toothaches, a personal examination of your mouth is a good idea. These are only a few symptoms of dental cavities. While it is important to be able to recognize what these symptoms mean, visiting a dentist is even more important. 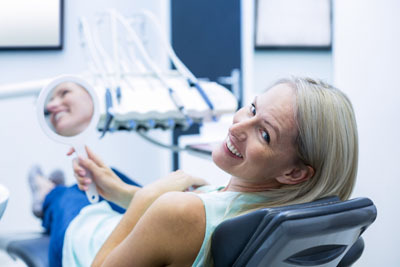 A dentist will also help you explore the options available to you. Request an appointment in our Manhattan Beach dental office here: https://dentalesthetics.net. Call us at (310) 923-7064 for more helpful information from Manhattan Beach Dental Esthetics.